Financial problems, medical concerns and physical limitations can all give seniors reasons to stress. Common signs of stress include chest pains, inability to sleep, mood swings and difficulty concentrating. If this sounds like a senior that you know, then there are ways that caregivers in Rhode Island can help. Scientists now know that encouraging seniors to read may hold the key to relieving their stress. Seniors who read often get caught up in the protagonist’s story, using the story as a means of finding a path to escape their current stressful conditions. As they do, they often find the courage needed to face each new real life challenge. Since seniors are never too old to learn, they gain a deeper understanding of themselves and develop new ways of thinking that helps the stress to melt away. If you are a reader, then this comes as no surprise to you, as you have long known that picking up your favorite book for a few minutes helps you feel better. Research from Emory University now supports this belief. But how does it work? 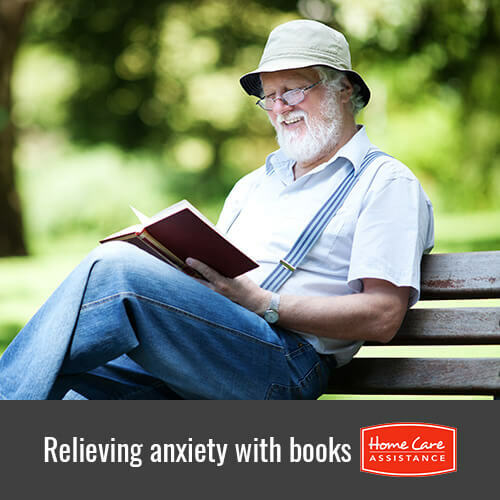 The process is known as bibliotherapy, a term that was coined by a Presbyterian minister in the early 1900s. The practice has become so popular in London that businesses are now hiring people with advanced degrees to help people choose literature that encourages them to cope with certain stressful periods of their lives. A study conducted by the University of Sussex found that reading even 30 minutes a day was effective in reducing stress levels by up to 68 percent. This study also suggests that the best books for seniors to read are those that are most interesting to them. Therefore, if the senior is able, you could plan a trip to the local library with him or her. In fact, seniors and their Rhode Island live-in home caregivers can both choose books that they find fascinating as caregivers have rather stressful jobs as well. For more information regarding stress relief tips for seniors and caregivers, turn to Home Care Assistance. We are the leading provider of Rhode Island senior home care that enables seniors of varying abilities to age in place with dignity. Call (401) 284-0979 to speak with a trusted Care Manager about customizing a unique care plan for your loved one today.